Preheat oven to 350°F and line a cupcake pan with 12 cupcake liners. Take the creamy vanilla filling and place it in a small bowl. Add 1-2 drops of red (for a girl) or blue (for a boy) food coloring and mix well. Place colored filling in a small Ziploc bag and seal. Make cupcake batter according to package directions. Fill each cupcake liner 1/3 of the way with batter. Cut off the corner of your bag holding the filling and pipe filling (about a tablespoon) in the center of each cupcake making sure not to touch the sides. Cover the filling with the remaining cupcake batter. Bake for 20-25 minutes and let cool. While cupcakes are cooling, prepare the chocolate ganache frosting. In a small bowl, heat the cream in the microwave for a minute. Place chocolate chips in a small bowl and pour the hot cream over the chocolate chips letting it sit for a minute to melt. Stir the cream and chocolate together. Be patient, it will take a while to incorporate. Once it's fully blended and smooth set aside to let cool for at least five minutes. The chocolate will get thicker as it sits. Once cupcakes are cool, dip the top of each cupcake in the ganache and let ganache set. You can speed up the process by placing them in the refrigerator. 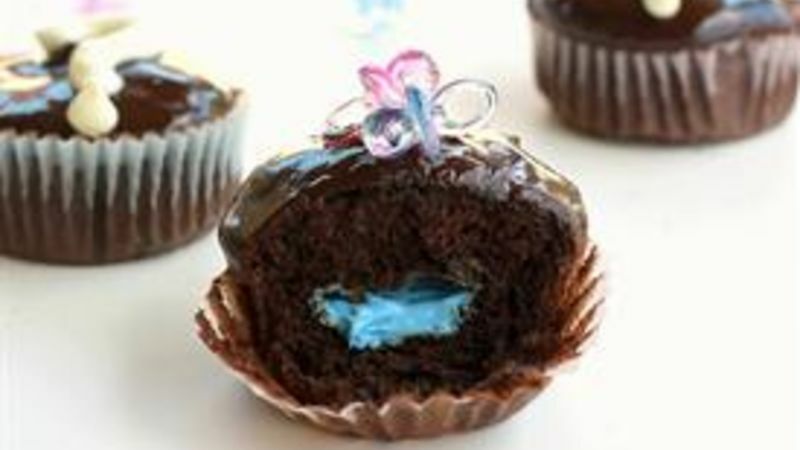 Once the cupcakes have set, garnish with blue and pink baby trinkets such as plastic pacifiers or booties. You may want to decorate some of the cupcakes with question marks. To do this just place the vanilla frosting in a Ziploc bag and cut off the corner. Pipe on a question mark. This recipe proves that an impressive chocolate ganache can be as easy as blending cream with melted chocolate chips and then letting the delicious mixture cool and thicken for a bit. You'll find that filling your cupcakes with frosting is surprisingly easy, too and whether that frosting is blue or pink, your guests will be more than pleased with tender chocolate cake and creamy chocolate ganache. A special announcement deserves a special treat and we can’t think of a tastier way to make a statement than with these gender reveal cupcakes. But you also don’t need a special occasion to make cupcakes, obviously! Check out our other cupcake creations. They’re easy enough to make any day of the week.